WASHINGTON — For the second time in a week, the Maryland Transportation Authority has removed the nest of federally protected birds, which built their home in front of a traffic camera at the Chesapeake Bay Bridge. 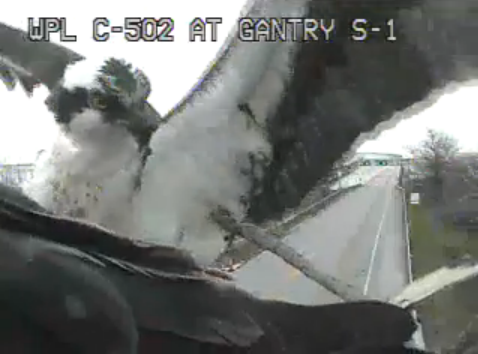 On Monday morning, MDTA crews removed the osprey nest built on a camera pole facing the Bay Bridge from the toll plaza. A pair of ospreys built a nest in the same spot last week, but MDTA’s efforts to relocate it Friday led to its destruction. The birds must favor the location. The ospreys built the nest again over the weekend. MDTA crews removed the nest around 9:30 a.m. Monday, before it was completely constructed. The birds were not present when crews removed the nest, says John Sales, MDTA spokesman. “They wanted to take it down before it got too big like it was last time,” Sales says, adding that the bigger the nest got, the more agitated the ospreys became when the camera moved. The nest must be removed because it is blocking the traffic camera, says Sales. Also, the birds have been captured attacking the camera. Last week, MDTA reached out to U.S. Fish and Wildlife Service for assistance in removing the nest. Fish and Wildlife, as well as Animal and Plant Health Inspection Service, gave MDTA the OK to relocate the nest as long as eggs were not in it, Sales says. Ospreys, like all migratory birds, are protected under the Migratory Bird Treaty Act. But their nests can be removed from some structures without a permit as long as there are no eggs or birds in the nest. After going through the same process twice, Sales says the agency will continue to remove the nest — even if the ospreys continue to call the area near the camera their habitat. “We’re going to have to either continue to do what we’re doing and get up there and get ahead of it before it gets too big, or we will have to consider other options,” Sales says. Other options could include building a platform specifically for the osprey nest, but that would have to be cleared by Bay Bridge Administrator Gordon Garettson, Sales says. For now, alternative options are not being pursued, Sales says. The best solution is to lure the birds away to an alternate nesting site, like a platform, says Dave Curson, director of bird conservation for Audubon Maryland-D.C. The birds prefer to nest on prominent, exposed structures – usually the top of an old tree. But light poles and pylons are popular alternatives for their large nests, Curson says. Ospreys are an iconic Chesapeake Bay bird. Today, more than 2,000 pairs of ospreys make their home at the bay during breeding season, which lasts from April through late summer. But the fish-eating predators are vulnerable to pesticides and in the 1970s fewer than 100 pairs of the birds could be found along the bay. Intense conservation efforts and the ban of pesticides like DDT has allowed the population to rebound, he says. “It’s wonderful to have them back. But it does mean that they nest in odd places,” Curson says. View the camera on the MDTA website. WTOP’s Amanda Iacone contributed to this report. Follow @WTOP on Twitter and WTOP on Facebook.